The article presents a system of clinical quality indicators for patients with non-ST-segment elevation acute coronary syndrome (ACS). The following measures are included in the system: “Antiplatelets administered”, “Anticoagulants administered”, and “Inhospital mortality”. For each measure a brief description, a scheme and a procedure of estimation including calculation with use of Federal ACS registry is given. It is proposed to use these separated indicators for clinical audit of health care quality. Popova YV, Posnenkova OM, Gridnev VI. System of clinical quality indicators for patients with non-ST-segment elevation acute coronary syndrome. Cardio-IT 2016; 3(2): e0201. Mozaffarian D, Benjamin EJ, Go AS, et al. Heart disease and stroke statistics – 2016 update: a report from the American Heart Association. Circulation 2016; 133(4): e38-e360. https://dx.doi.org/10.1161/CIR.0000000000000350. Yeh RW, Sidney S, Chandra M, et al. Population trends in the incidence and outcomes of acute myocardial infarction. The New England Journal of Medicine 2010; 362(23): 2155–2165. https://dx.doi.org/10.1056/NEJMoa0908610. Hamm CW, Bassand JP, Agewall S, et al. Guidelines for the management of acute coronary syndromes in patients presenting without persistent ST-segment elevation. The task force for the management of acute coronary syndromes (ACS) in patients presenting without persistent ST-segment elevation of the European Society of Cardiology (ESC). Eur Heart J 2011; 32(23): 2999–3054. https://dx.doi.org/10.1093/eurheartj/ehr236. Oshchepkova EV, Dovgalevsky PYa, Gridnev VI, et al. Key data elements and definitions of the Russian acute coronary syndrome registry database. Cardio-IT 2014; 1: 0201. Russian https://dx.doi.org/10.15275/cardioit.2014.0201. Oshchepkova EV, Dovgalevsky PYa, Gridnev VI, et al. Federal Registry of Acute Coronary Syndrome user guide. Cardio-IT 2014; 1: 0203. Russian https://dx.doi.org/10.15275/cardioit.2014.0203. Gridnev VI, Kiselev AR, Posnenkova OM, et al. 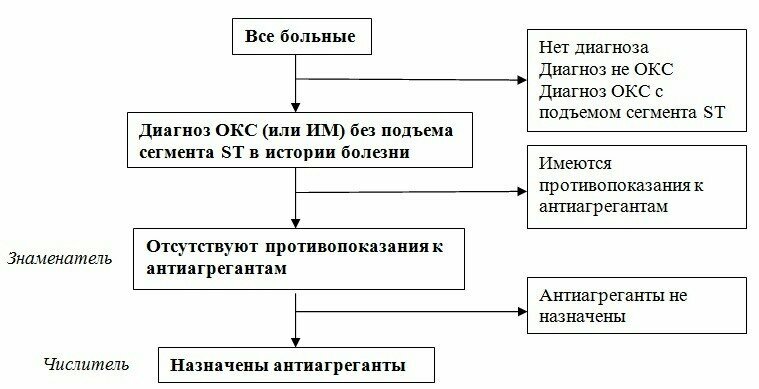 Objectives and Design of the Russian Acute Coronary Syndrome Registry (RusACSR). Clinical Cardiology 2016; 39(1): 1–8. https://dx.doi.org/10.1002/clc.22495. Roffi M, Patrono C, Collet J-P, et al. 2015 ESC Guidelines for the management of acute coronary syndromes in patients presenting without persistent ST-segment elevation. Task force for the management of acute coronary syndromes in patients presenting without persistent ST-segment elevation of the European Society of Cardiology (ESC). Eur Heart J 2016; 37: 267–315. https://dx.doi.org/10.1093/eurheartj/ehv320. Yulia V. Popova – MD, PhD, Researcher, Department of Emergency and Interventional Cardiology, Research Institute of Cardiology, Saratov State Medical University n.a. V.I. Razumovsky, Saratov, Russia. http://orcid.org/0000-0002-2402-7588. Olga M. Posnenkova – MD, PhD, Senior Researcher, Department of New Cardiological Informational Technologies, Research Institute of Cardiology, Saratov State Medical University n.a. V.I. Razumovsky, Saratov, Russia. http://orcid.org/0000-0001-5311-005X. Vladimir I. Gridnev – MD, DSc, Head of Department of New Cardiological Informational Technologies, Research Institute of Cardiology, Saratov State Medical University n.a. V.I. Razumovsky, Saratov, Russia. http://orcid.org/0000-0001-6807-7934. Received 22 March 2016. Accepted 18 May 2016. © 2016, Popova Y.V., Posnenkova O.M., Gridnev V.I. Gridnev, Vladimir I. - Popova, Yulia V. - Posnenkova, Olga M.